With the 3.2r release of Alfresco Share, the Alfresco Records Management module is now available in the Enterprise edition. Alfresco has recently started a free trial program to get started using Alfresco Share and Records Management. Click here to sign up for it. 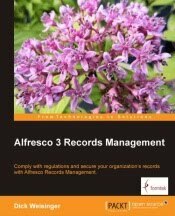 Paul Hampton, Product Manager at Alfresco, has recorded a number of Share Records Management videos. More of them are available on this page. I've included one of the videos below for your viewing interest. This video reviews the Fileplan within the Alfresco Records Management solution. It shows how multiple users will be presented with different views of the Fileplan based on their security setting and role.